I think health care consumers should receive a yearly statement that indicates exactly how much the provision of health care services related to their individual MCP number cost in a fiscal year. The format would be very similar to your credit card bill providing a list of itemized expenditures and an annual total. Every doctor's visit, every test and every treatment. The statement should also include information about the cost of healthcare services in comparison to the provincial budget. People need to know how much the delivery of health care costs.They need to know what they as individuals spend, and how much of total government revenues is expended on the delivery of those programs. It would put the ballooning cost of health care in perspective. It would also help the public understand the kind of choices governments have to make. If I take my car to a garage for a check-up and oil change, I get an itemized list of the costs involved. Am I going to put up with being gouged? Of course not! Why would a health consumer be any different? In the end it is out tax dollars that fund the system. We pay for it? Why should we accept waste and inefficiency, when those misused resources could be better allocated? A press release from the Official Opposition boiled my blood today. The headline is political partisanship at it's worse. 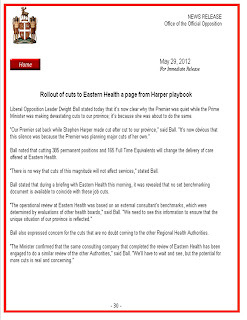 "Rollout of cuts to Eastern Health a page from Harper playbook"
The Liberals want to tie Harper to Dunderdale, it is a valid political mechanism. If the Liberals can attach Harper's unpopularity to Dunderdale, than they benefit. The provision of healthcare services is a hot button issue. It impacts everyone, especially joe average sitting in front of the TV watching the evening news. Putting aside the political marketing, I wonder how responsible, dare I say - credible, it is for the opposition to suggest that health care boards in the province could not be run more efficiently. No one but the unions - who want to protect jobs for the sake of the jobs - is talking about cutting front line services. The issue is doing so in a way that reflects the costs that it can be done for in other parts of the country. The government does not possess a bottomless pit of financial resources, and even if it did, we should expect the maximum benefit for every dollar we spend. Instead of looking for conspiracy theories and trying to milk "hot button issues" for a little spike in a polling period, perhaps the opposition should be seeking credibility by serving up concern with a helping of solutions and responsibility. Is it any wonder the Liberals are lagging way behind the NDP? Offer something concrete, for a change, and stop sounding like whiners without a plan! Peter, it may well be that Health Care costs have increased because of inefficiencies caused by the "corporization" of health care. By that, I mean that all of the smaller Health Boards were rolled into three big ones several years back. I don't know for sure but it seems to me that these boards tend to increase their bureaucratic "output" at the expense of basic care and services. They try to sell you on the efficiencies of "bigger" entities but I am certainly not convinced. The bigger they get, the more layers emerge, and one wonders how much these administrative management types cost the system. Basic patient care provisions seem to require massive bureaucratic attachments nowadays and the big bucks are spent on these CEO types. I would like the system itself evaluated by an independent analysis, even though they supposedly were, and efforts made to look at best care practices in other countries. For example, India appears to have developed some basic prodcedures at a pittance of the cost of the same service here. Can we learn from that and can we incorporate it here? I would expect there are numerous other examples that we could copy, as well, even if they come from privatized health care ystems. 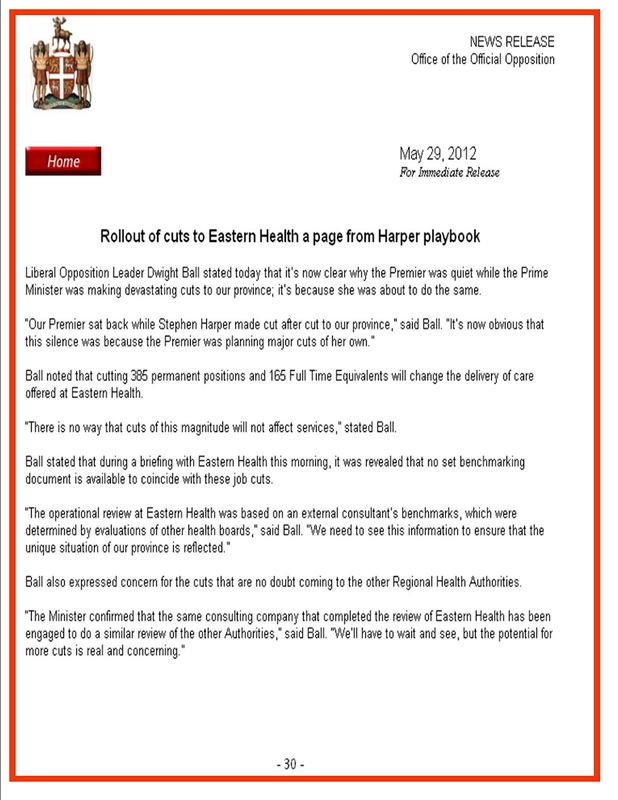 In 2002, the Conservative government in Ontario did that very thing under a 6-month pilot project. I don't know exactly what happened, but I do know it never really went anywhere. Seems the costs might've been higher than the benefits. The red tape and managerial level needs to be reviewed. I assume that is what the centralization of the boards was supposed to accomplish. I am not sure it worked as well in practice as it was sold. Personally, I think we need a full provincial review - the results might be controversial. I would much prefer that we have centers of excellence, than thinning out the resources we have to duplications. I know that the Libs started rationalizing services like laundry and meals in the mid 1990's to find efficiencies and redundancies. If it meant less money for duplication, greater efficiencies than I am all for it. As well, bigger budgets mean bigger numbers, the little stuff can slip by...ie. the Tim Hortons debacle. How frigging stunned. I know that the Sir Thomas Roderick Hospital Board was a fairly efficient board that worked within it's budget and the government created a western board that lopped it in with a very inefficient system in Corner Brook. So there is truth to what you say. Best practices cost money. You can bet that India's best practices do not equate to ours. Hence the retraining many African and Indian doctors must go through (and examinations) to be certified to practice here. Someone who knows a great deal about that stuff is Ed Hollett. Perhaps, he can enlighten you on that. There would be a cost involved, but perhaps that could be integrated into the communications budget at MCP, the department of health and the board communication budgets. MCP records all records, all visits. I can not imagine that it would be too expensive to generate these reports and mail them, our email them. If a hospital loses money operating something as lucrative as a Tim Hortons franchise than there are very serious problems. It baffles the mind to think what might be going on with the purchase of supplies, dispensing of medicines, staffing and other day to day operations.